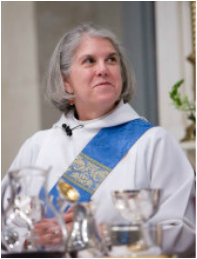 The Vestry is very happy to announce that we are calling the Reverend Ann McLemore to be our interim rector. She is coming to us from St. James Church in Jackson Mississippi, where she was an assisting priest. She will serve as Rector as St. John's until we call a permanent Rector. Ann and her husband, Charles, lived for 22 years in Cancun, Quintana Roo, Mexico, and she is bi-lingual in English and Spanish. Ann helped plant a new Anglican congregation in Cancun. She was later ordained deacon and then priest in the Diocese of Southeastern Mexico. In 2004, Ann returned to the United States, to work as rector at churches in the Diocese of Southwest Florida. She established the first ever Spanish language ministry at St. Giles Episcopal Church in Pinellas Park, Florida. Ann’s husband passed away in 2008. Ann came to St. James church in Jackson, Mississippi in 2014, where she served as Associate Rector, focusing on ministries including Outreach and Pastoral Care. We are extremely happy and blessed to have Ann here to help lead us through this important period in the life of St. John’s! Deacon Victoria Mason was born in Seattle, Washington, but she claims Austin as the closest to being her home town. She earned her B.A. in History and English from the University of Texas at Austin and her M.S. in Vocational Rehabilitation from the University of Wisconsin – Stout. Her first career was as a vocational rehabilitation specialist. Her second career was in the Child Support Division of the Office of the Attorney General where she served as a trainer, policy developer and software development manager. Victoria completed the Iona School for Ministry of the Diocese of Texas in preparation for ordination as a Deacon in February 2007. “I was drawn to the ordained ministry for all my adult life, but I never felt I should ‘leave the world,’ she explained. “I was first attracted to the diaconate because of its being simultaneously in the world and in the church.” She is married to Roy Larsen; has three grown children and two adorable granddaughters. Victoria is bilingual, having learned Spanish while living in Lima, Peru during her childhood. She served as Deacon at San Francisco de Asís Episcopal Church and El Buen Samaritano in Austin for four years. She served at St. David’s Episcopal Church prior to this. She is constantly amazed at God’s economy, finding that the work skills and experiences from her first two careers are assets in her ministries as a deacon. Deacon Mason’s current diocesan level ministries include serving on the Committee for the Diaconate and the Discernment Process Task Force for the Commission on Ministry. Minerva Camarena Skeith is a native of Laredo, Texas and is fluent in both English and Spanish. She moved back to Austin in 1998 and married her husband Paul Skeith in 1999. They have two sons. Their oldest, Samuel just turned 14 years old and will attend high school next school year. Augustin is 11 years old and will attend middle school next school year. Her husband was ordained a priest in 2017 and has been leading the SoCo Episcopal Community for the last three years. Minerva is a postulant of the Diocese of Texas and her sending parish is St. David’s Episcopal Church in Austin. Prior to becoming a postulant and attending the Seminary of the Southwest, she was active in her children’s elementary school and at St. David’s. She served on the board of the PTA and the Campus Advisory Committee. She also served on the vestry of St. David’s, co-chaired the Hispanic Outreach Ministry and Education (HOME), and co-chaired the Amos Guild, St. David’s leadership and social justice ministry. Minerva was a member of the Austin Interfaith strategy team for over 10 years.